Did you know you can order a commemorative Shelby signature for your airbag cover, glove box, or other part of your Shelby Mustang, Cobra or other Shelby powered car? The Carroll Shelby Foundation was established by Carroll Shelby in October 1991 for children who need organ transplants. Carroll Shelby suffered from heart conditions for several decades and after receiving a heart transplant, decided to help fund children’s cases with similar needs. The foundation is now extended to helping children with other life threatening health problems and provides funding to other organizations for medical assistance. 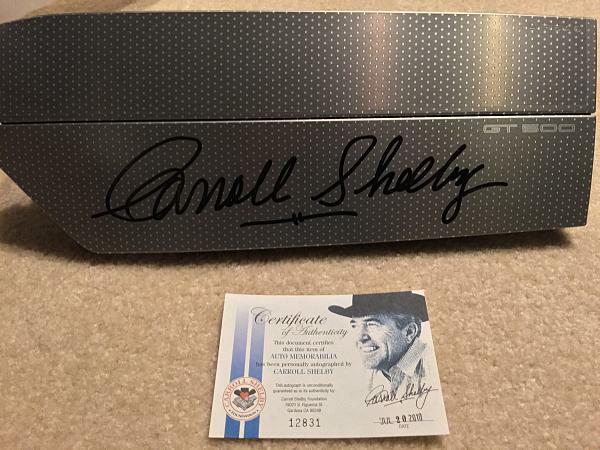 One of the Carroll Shelby Foundation’s means of raising funds is by offering commemorative Carroll Shelby signatures complete with certificates of authenticity. The signatures are offered for a $50 donation and are digitally printed directly onto panels like SRS airbag covers. The signature is realistic due to the effect by the soft felt pen used by the printing machine. Every signature is unique due to the process used. The foundation also provides scholarships for car technical training and other automotive education. The foundation is a 501 (c) 3 registered charity and the Shelby.com website states that more than 23,000 patients have been supported with organ transplants. Click here to learn more about the Carroll Shelby Foundation. Click here to order your commemorative Carroll Shelby signature.